Doesn't the song sound just perfect to teach kids about patterns? Well, we've chosen this song because it's one of our favorites, you can choose any other rhyme like Ringa Ringa, Orange juice and lemon...etc. 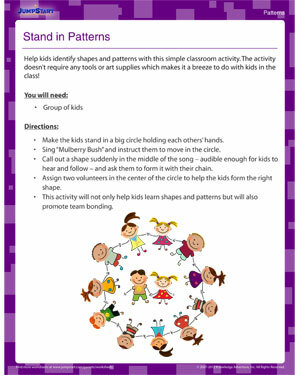 Take this chance to help kids learn patterns hands-on with a lot of fun, in the classroom. The classroom activity is fun, fulfilling, and rewarding! Try it out to see the kids learn as merrily as they play!